Hi all! 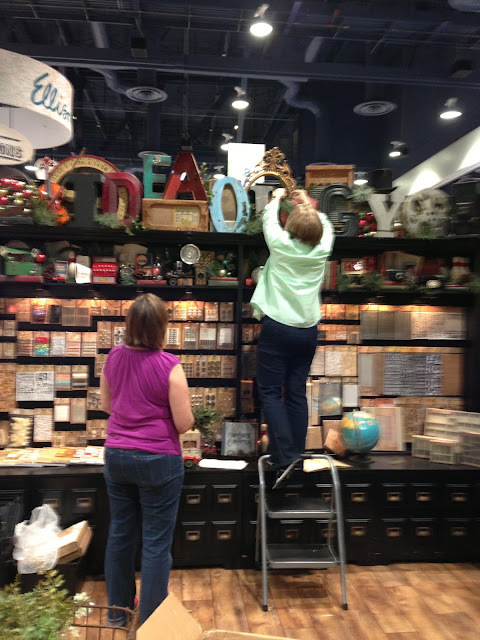 I’m back from the summer CHA show and wanted to share some pictures of the idea-ology booth. It takes a team to set the booth and I was very lucky to have Debbie, Richele Christensen and Chelle Fowler plus the Advantus girls, Sarah, Rana, and Lindsey helping us. 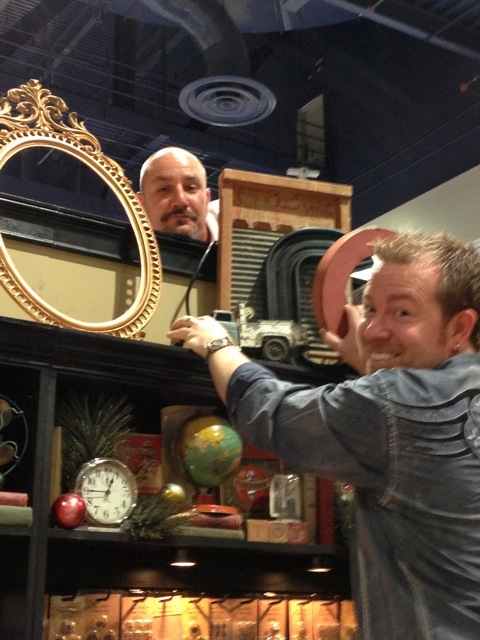 Unpacking idea-ology is a a huge feat in and of itself. We have 2 huge crates of props to work with that must be unpacked and set out before the displays can be done. 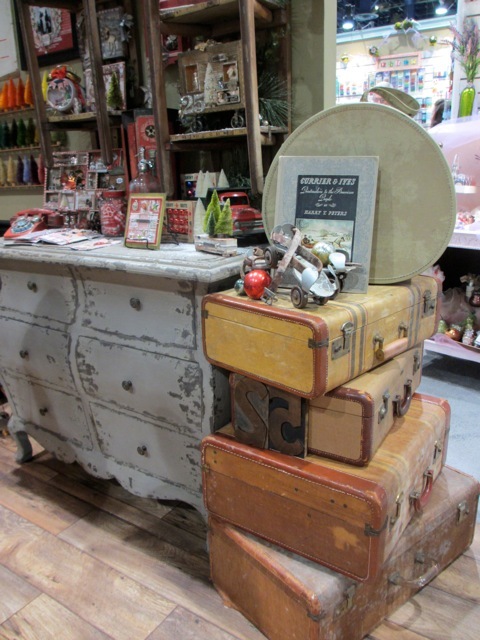 We have an additional 8-10 vintage suitcases that are filled with props and are stored inside the booth itself. A lot of stuff, right? Sometimes it feels like we will never wrangle that many props, but in the end we always do. The things that are left after propping either get edited out or go back into the boxes for next time. Deb and Richele in the thick of things. 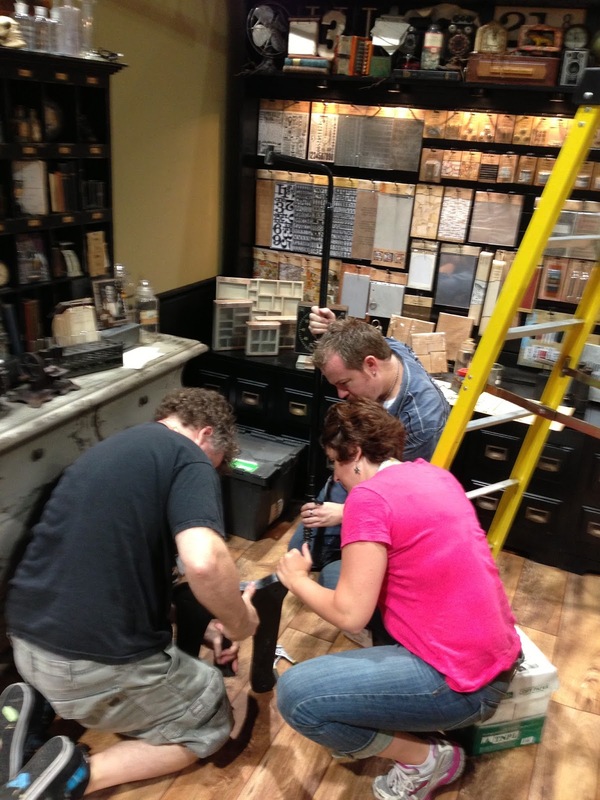 Tim, Kenny, and Sarah putting together the base for our "friend". Our friendly electrician popping his head over the booth. That was a little scary since Tim didn't know he was behind the washboard. The seasonal show is a fun show to set. We decided to do half the booth Christmas and half Apothecary, to go with the Laboratorie paper stash. 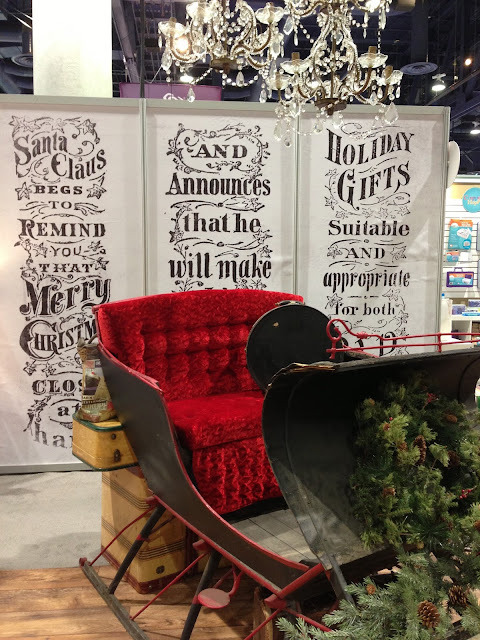 Of course, front and center is the fabulous vintage sleigh with 3 vintage chandeliers hanging above. The backdrop is changed at each show. This time it is one of the papers from the new Merriment paper stash. I think it was the perfect choice. 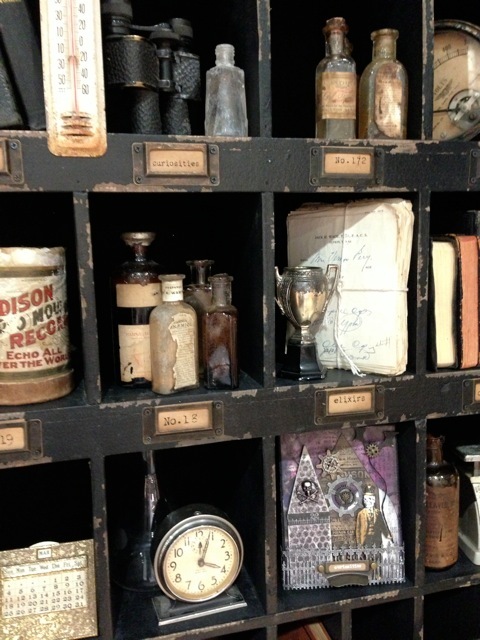 The Apothecary side of the booth was especially fun to set. Tim bought a really great black cabinet to sit on top of the dresser. It was delivered to my house so I could make the labels for each of the 15 pigeonholes. 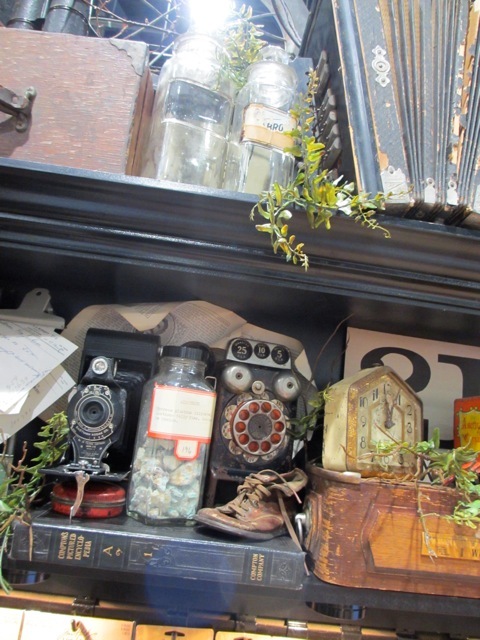 Once at the show, the cabinet was stuffed with all kinds of vintage things, books, prescriptions, bottles...really anything that might belong in an apothecary shop. We did manage to get in a few samples too! We also brought a “friend”, who was never formally named. He was a great prop; so many people came over to took their picture with him, shake his hand or put the arm on their shoulder...he made for a lot of laughs. Deb and Richele taped all the old prescriptions together to look like they were tumbling out of the case. 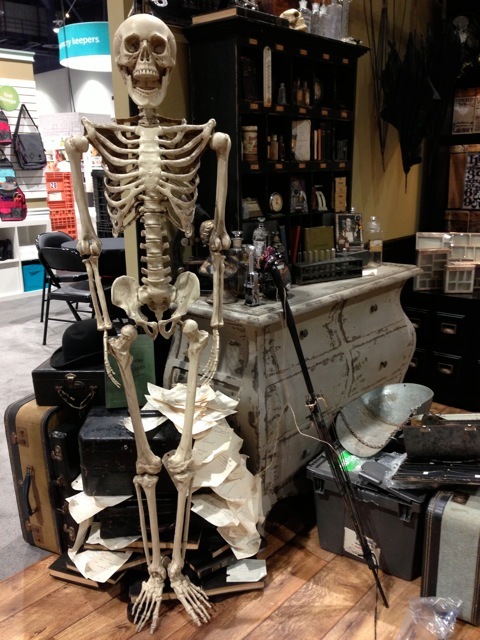 Well, I hope you have enjoyed a little slice of the idea-ology booth. I love when people wander in and say, “I could live here”. To be honest, I think I could too. 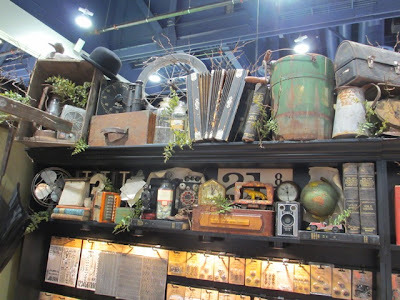 If you are interested in more pictures of the booth then stop over at tim's blog this week for an in depth look at each company he works with and samples. Oh, and I believe he is giving away prizes too! Hi Paula, Thanks for the great pictures of the booth. It looks like you all got a lot done in a short amount of time. The props look fantastic. 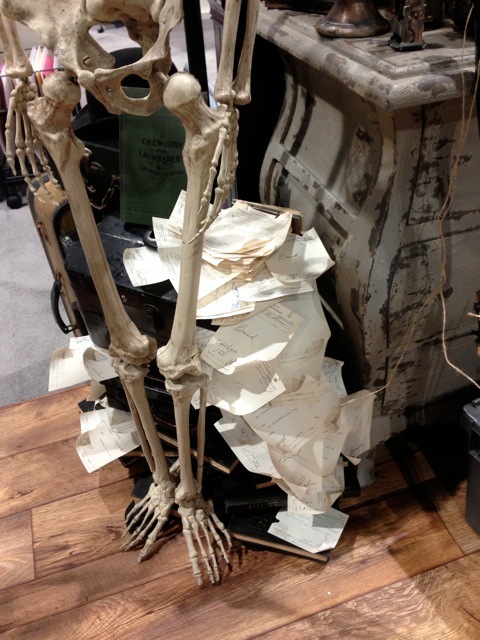 I just came from Tim's blog and saw some of the gorgeous projects from the show. Simply amazing. Thanks for all you do! I look forward to and am always in awe of the displays you help create. I anxiously await each one. Does it break your heart to tear them down? It would mine! 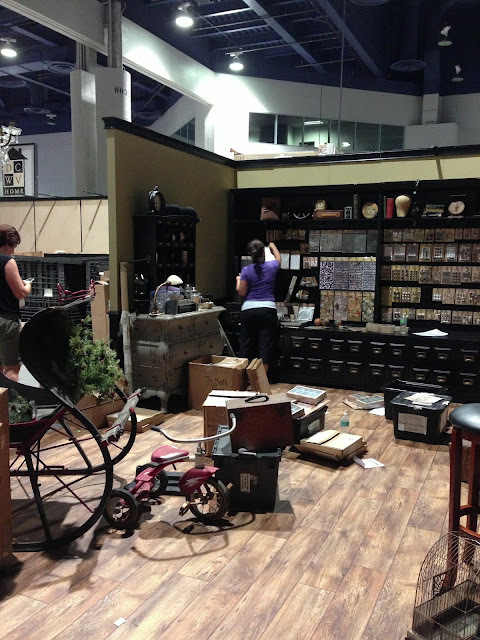 You are right Brenda, tearing the booth displays down is really sad especially after the 3 day summer show. The winter show is 4 days so we get one more day to enjoy it. It does give me ideas of things I might do in my home though. And that can last much longer. Hi Paula, WOW!! 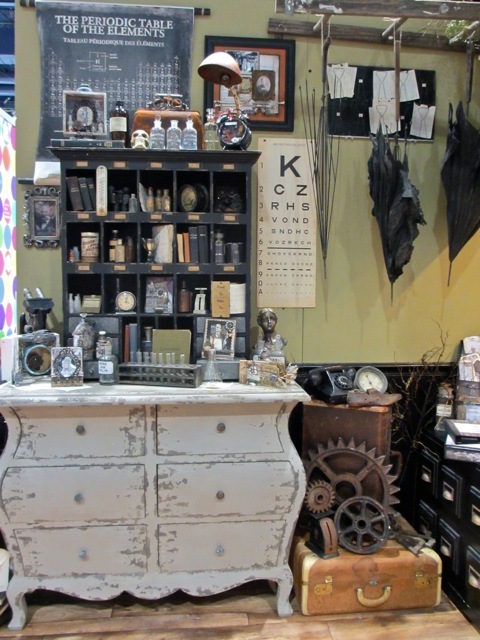 The booth looks amazing......so many details......Its on my bucket list to make it over to a CHA show and the Idea-ology booth is my first port of call! Totally amazing... the work you put in is phenomenal - but the results are completely worth it!! Congratulations to you all - it is a visual feast!! I love how your JUNK looks. Very well done, both Christmas and apothecary. Bravo!! Paula, thank you for a behind the scenes look at all the hard work the team does. And the art work is amazing - as always! now that is a great name. Do you plan out the booths on paper, on the computer,or other way, and then have pictures in hand to execute when you arrive to set up, sort of like some stores have pictures of how their inventory has to look? Or do you collect a bunch of stuff with a theme in mind and wing it? Just curious. what a great question, thanks. We come up with a theme or an idea (the seasonal show is easy) and then Tim collects what is needed. I fill in on my end, like the ladder I found on the side of the road (umbrellas are hanging from it). Once we get to the show, the ideas are already formed in our mind and the plan takes off from there. Sometimes things change or another idea is formed while we are setting the booth but for the most part the plan stays in tact. Great job! Great fun to look at and explore. Paula: Thank you for all the pictures. Whew! Lots of work there. But, oooo! Such candy for our eyes! The booth looks fantastic! I love the cabinet on the dresser as well as the large cabinet housing all of the new product...I'd love to have something like that. Great show and thanks for sharing the pictures...the holiday displays were great too....well, heck...loved it all! Amazing, as always. The best booth of the show, as always. thank you Jennifer...so glad I could bring the booth to you! Thanks so much for sharing these amazing photos! A ton of work but so worth it!! It all looks just so creative!! Totally amazing, Paula.The amount of work that goes into getting everything set up boggles my mind. Thanks for sharing all the fabulous pics. Wow! I always love looking at Tim's booth. There's so much goodness packed into such a small space. I bet its gorgeous in person. Great job! Thank you for all the wonderful photos. You are all so talented. What a team. Again, I have to say "YOU ARE AMAZING". thanks Joy! It really is a group effort to get it done in time. We like working together and that is half the battle! We just keep each other laughing! Hi Paula, the booth is just amazing - and an absolute ton of work!! It is so impressive - I think I could live there too - and play with all Tim's goodies!!! Thanks so much for sharing this! Cooool! The displays look amazing! How exciting it must be to attend even just one of these shows! Its nice that through you and of course Tim & Mario, we at least get to enjoy the pics and info you share with us! Thank you so much. 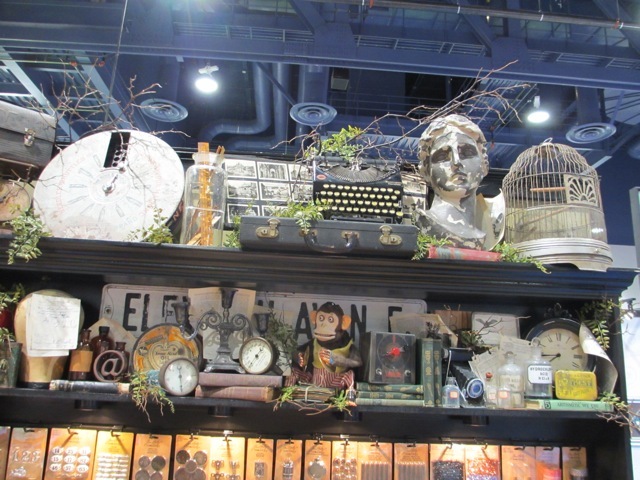 All the different display paraphernalia just makes my heart SING! I used to do a monthly window display and a large quarterly jewelry display cabinet for a couple of organizations and it was so much fun picking out display pieces and then staging it. I miss that. This is truly inspiring! you know that is what we are going for..inspiring! Sometimes people come into the booth and say, what are you selling? lol. I love walking into the booth each morning and taking down the coverings..revealing the displays each day is so much fun. Wow, you all did such an amazing job on the booth!!! I can only imagine how much work goes into setting this up, but the end result is fabulous!!!! 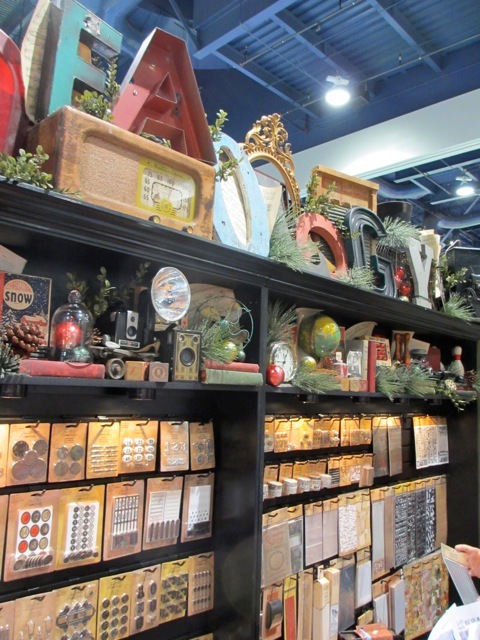 Every year, I can't help but think how wonderful it would be if my craft space looked just like this!!!! Everything beautifully organized, lot's of space and cubbies. Well one can only dream. Great job. Thanks for sharing the pics! They are AWESOME! Must be incredible fun and a lot of work at the same time. But how rewarding to see it all put together. Thanks again for sharing, loved it! Lots of work for sure, had to laugh when I seen the ladder was still being put to use. Figured you had taken it home after the last show. Great looking booth as always!!! good eye Peggy! that ladder went back into to the crate at the end of the show so you never know, it make make another appearance in Jan '14! These pictures make me oohhh and ahhhh. I loved getting a closer look. Thank you! Everything you all do is always amazing! You guys are amzing, The booths look fantastic, Thank you for all the pic !!! 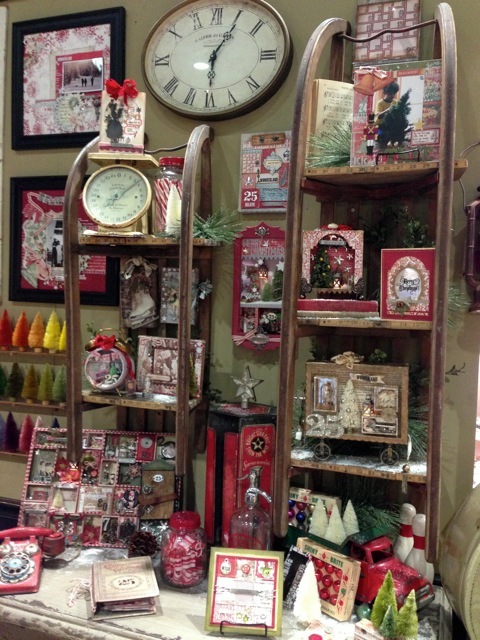 Thank you so much for sharing these photos with us, I love looking at all the displays and samples. Everything is always so inspiring. Thanks to everyone for all their hard work. Most awesome booths at the show! So great to see you guys too! The amount of effort behind the scenes boggles the mind! It is so worth it, and the booth (pictures at least, since I cannot attend CHA)is top-notch. Great job to all! 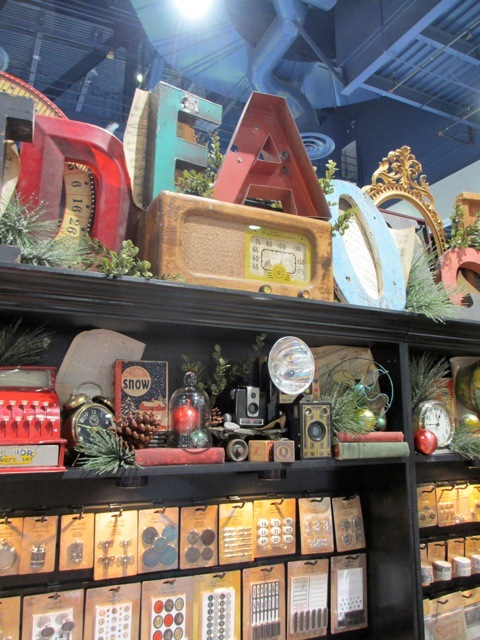 Gorgeous displays and it looks like so much fun! I've never lingered so long over a group of pics!!! A M A Z I N G .
WOW! J'aime tout. La déco, les créations et les produits. OMG as if the awesome products aren't enough eye candy I can't believe the displays. I want one of everything! 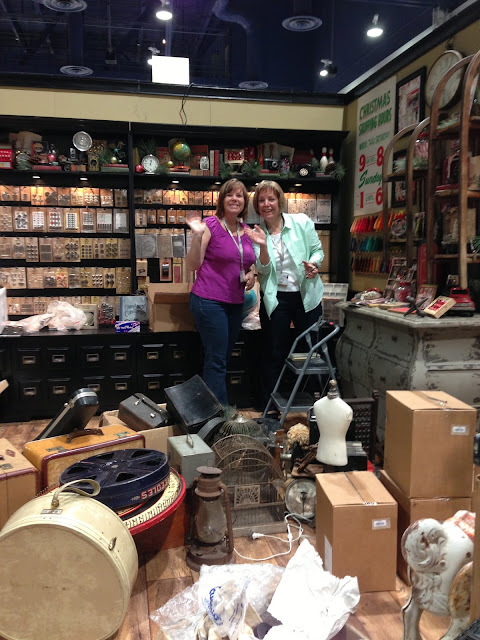 I love to go junking but prices don't always allow buying!!! My latest adventure is for a round suitcase like your white one. I saw an awesome doggy bed made out of one for my sweet little yorkie! Keep up the great work! Truly terrific products and display!